This newly planted bed has a 5 way pear (see the red tag hanging from one branch), 6 Dwarf blueberries, 2 wintergreen plants, strawberries, sweet alyssum, rosemary, a tall prairie Echinacea which the butterflies loved, volunteer lettuce and swiss chard and a lovely white edged hosta! 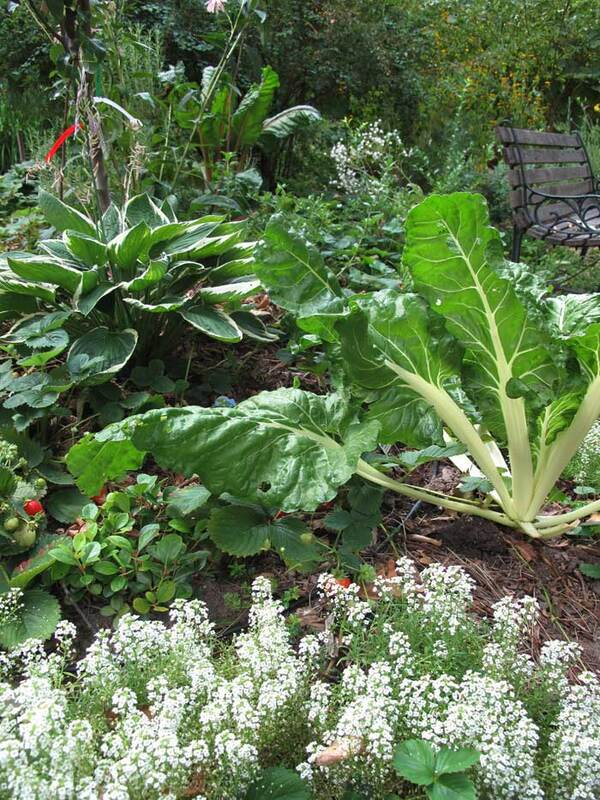 Lots of food in one small decorative bed! Last evening as I wandered the garden collecting food for dinner – a few beans here and a few small tender kale leaves there – I was struck by the thought that this may have often been the way that our ancestors foraged for a meal. Not having refrigeration or supermarkets, I imagine they often picked things shortly before they planned on eating them. I’m sure that there were things that they preserved in some way and stored for winter, but I imagine that often they did just what I do each day; wander around and see what’s ready to eat and pick it for a meal just before I eat it. Each morning I go out with a small bowl and forage for berries for my breakfast. From May through a good part of October I find yellow and red Alpine strawberries, Seascape strawberries (an everbearing), red and yellow raspberries, wild blackberries, thornless blackberries, blueberries and when I’m lucky – the occasional wild woods strawberry – which I always eat on the spot because they are so incredibly tasty. Much better than any other strawberry! I’m working to encourage some of our wild Thimbleberry to spread in the orchard, too. The Alpine and Seascape strawberries produce all season long and the other berries come and go, but I always manage to find a nice big bowlful to add to my breakfast and at times extra to freeze for winter. Kale is a beautiful decorative plant on top of being such a valuable food! For lunch I usually forage for tomatoes, cucumbers and tender young Swiss chard or kale leaves for sandwiches or salads. In mid afternoon I will often wander around looking for a snack – a ripe plum or cluster of grapes or an apple or pear ready to eat. Next year I may have hardy kiwis to snack from, as well as pawpaw, persimmons, cherries, mulberries, goji berries, service berries, and native huckleberries. One of the great gifts of growing edibles in your garden – is that you get to EAT them – utterly fresh and perfectly ripe! 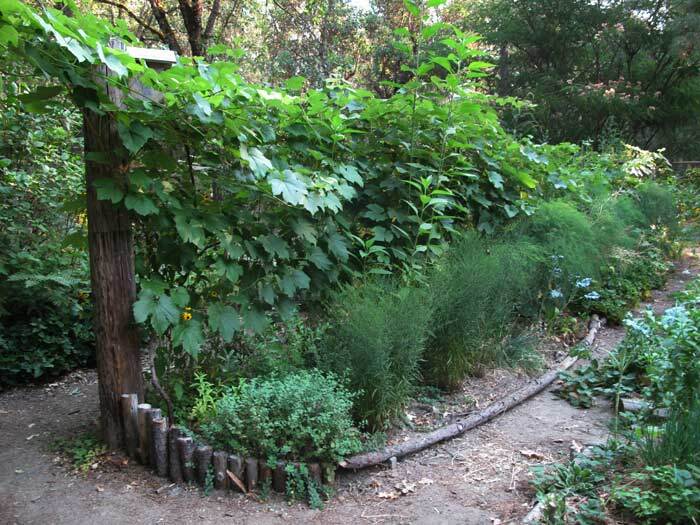 I am driven somehow to create a garden that has a bit of a wild, “natural” feel to it, and have berries and greens and other veggies and herbs growing all over throughout my half acre or so of “cultivated” land, so when I am looking for something to eat, I truly do some wandering. One of the unplanned benefits of that wandering, is that it keeps me in touch with what is going on all over the garden. 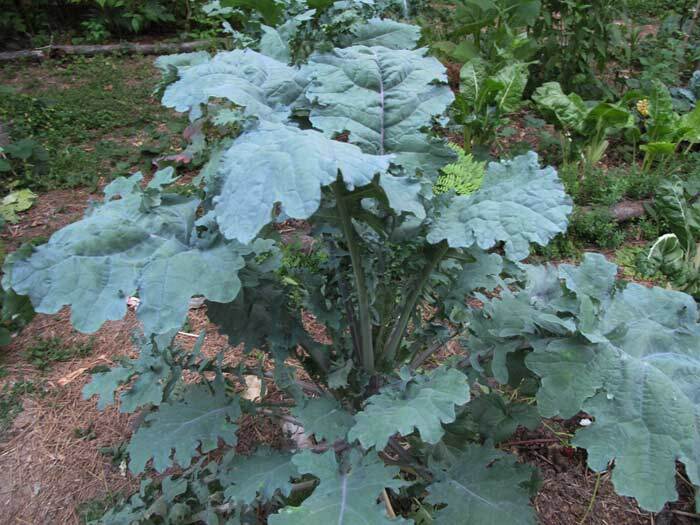 One of the planned benefits is that if the bed of kale in the annual veggie garden is attacked by aphids – I usually find that the isolated plants scattered throughout the orchard and other gardens are unscathed! If some critter (raccoon, rat, bird, yellow jacket?) discovers the wonders of a particular fruit – there is often enough to share. I’m sure it was like that for our ancestors, too. They shared the bounty of the land with bears and birds and all manner of wild creatures, and I’m sure that felt normal to them. I like the idea of sharing my garden with other creatures, even though sometimes they take more than I would like them to – which tends to make me cranky. Scarlet runner beans growing next to the entry gate… pretty red flowers, tasty beans! Recently my little prune tree had it’s best crop so far and after weeks of waiting for the fruit to truly ripen, the raccoons discovered them and ate every last one in one night! I must admit to a nasty thought or two about that. 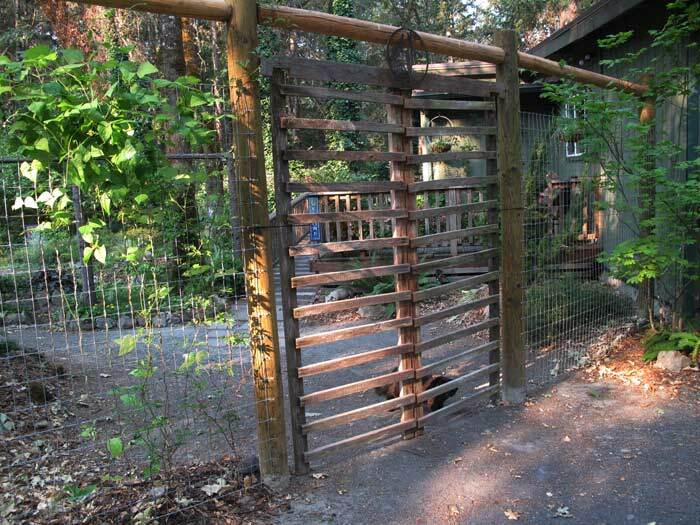 There are some – like deer and my sweet chickens – that tend to do too much damage to allow them in. But then I’m not living in the wild – and so I have to live with compromises – as well as the creatures I can’t fence out. As a small child I remember foraging for food – sipping nectar out of the backs of phlox flowers, making little sandwiches with wild mint, finding wild banana trees along a creek in Florida that my brother and I returned to over and over, to harvest small sweet clusters of bananas. When we were a little older we fished in lakes and streams for “sunnies”, and caught and ate soft shell crabs and clams on the Jersey coast. There was something wonderful and primal about finding wild food, that appealed to some deep part of my being, and I suppose my efforts to recreate a “wild” garden here, may come from that remembered joy. I can’t help but think of the pleasures many gardeners are missing by not having “edibles” tucked in all through their gardens. Wonderful! I could taste the berries. I’d love to visit your garden. Your photos add so much. Thanks Linda! I’d be happy to share my garden with you… The photos don’t really do it justice. I love the feel of foraging in my own back garden, so I can empathise with what you say. You must have a fair amount of ground to have such a range of fruit and vegetables? I have lots of room here – but I have done the same thing on a small lot in town. It’s amazing how much food you can grow in a very small space using walls and fences for vines and growing things like strawberries around and under taller plants as groundcovers. Even fruit trees can be grown flat against a wall. Things like blueberries can take the place of other ornamental shrubs and be just a beautiful AND give you fruit! I’m trying to put together a blog post on this very subject so I’m glad you asked! Stay tuned!